One of the greatest experiences I had in Tokyo so far. Even though you are not provided with any commentary as to what is happened and you sit on the hard wooden floor for about 1.5 hours, it’s still worth it. Despite their size, sumo wrestlers are very agile. Don’t forget to try some chanko nabe for lunch while you’re in Ryogoku. Chanko Tomoegata is recommended. 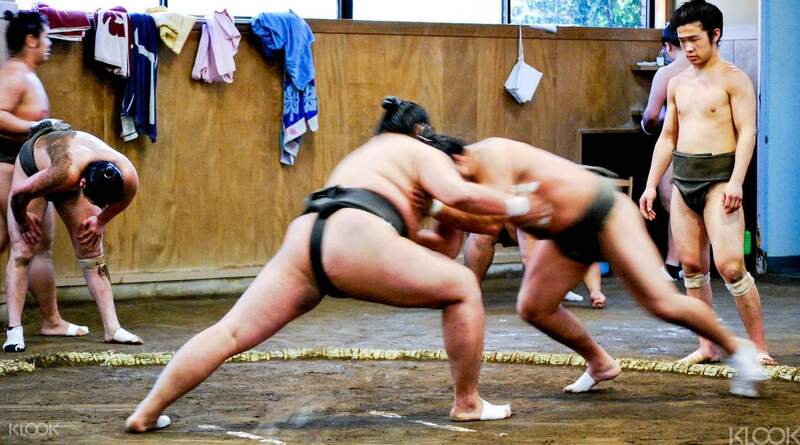 It's a fair statement to say that sumo wrestling must be one of the world's most unique national sports. Sumo originated in Japan as early as the 1600s and Japan remains the only country where this heavyweight sport is practiced professionally. Fighters live in communal 'stables' where every aspect of their daily lives is dictated by strict tradition. These traditions, etiquette and customs are not taken lightly. Many sumo stables are not open to foreign visitors and for those that are, even spectactors are expected to adhere to certain rules. Meet up with your tour group outside the designated meet up point in Tokyo before you visit to the stables and watch the wrestlers practice the art of sumo. Make sure not to eat, talk loudly, or take photos with bright flashes or loud noises so you don't distract the wrestlers! One of the greatest experiences I had in Tokyo so far. Even though you are not provided with any commentary as to what is happened and you sit on the hard wooden floor for about 1.5 hours, it’s still worth it. Despite their size, sumo wrestlers are very agile. Don’t forget to try some chanko nabe for lunch while you’re in Ryogoku. Chanko Tomoegata is recommended. One of the greatest experiences I had in Tokyo so far. Even though you are not provided with any commentary as to what is happened and you sit on the hard wooden floor for about 1.5 hours, it’s still worth it. 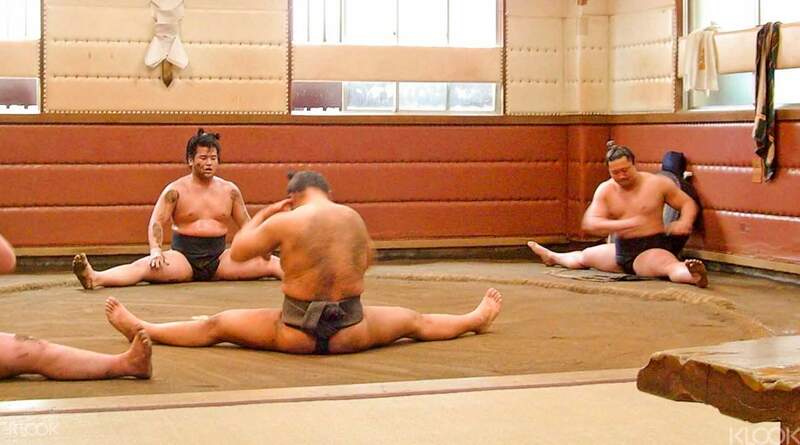 Despite their size, sumo wrestlers are very agile. Don’t forget to try some chanko nabe for lunch while you’re in Ryogoku. Chanko Tomoegata is recommended. Clear instructions. Knowledgeable guide and such an amazing experience. Although you are only watching a practice the sumo athletes give it 💯. I would recommend everyone to experience this. Clear instructions. Knowledgeable guide and such an amazing experience. Although you are only watching a practice the sumo athletes give it 💯. I would recommend everyone to experience this. Excellent. Great guide and very knowledgeable. Easy joining. instructions. Well worth the money. Totally enjoyed the experience. Excellent. Great guide and very knowledgeable. Easy joining. instructions. Well worth the money. Totally enjoyed the experience. We really enjoyed this experience. We arrived a little before our start time at the stable per the instructions via email that we received. Once everyone arrived we were led into the space and told to be quiet for the 60+ minutes, which was not a big deal. We were able to see the wrestlers warm up, practice, cool down and then were able to take a photo with a few of them at the end. My mom and my nephew also said it was our coolest experience in Japan and we were all happy we went. We really enjoyed this experience. We arrived a little before our start time at the stable per the instructions via email that we received. Once everyone arrived we were led into the space and told to be quiet for the 60+ minutes, which was not a big deal. We were able to see the wrestlers warm up, practice, cool down and then were able to take a photo with a few of them at the end. My mom and my nephew also said it was our coolest experience in Japan and we were all happy we went. This is a really unique, once-in-a-lifetime experience, and it's worth every penny. One note: you'll be sitting on the floor for around two hours, unable to move, so wear comfortable clothes and use the bathroom before you enter the stable. Older kids would probably enjoy this, but for younger kids, it might get boring and they might get impatient and antsy, so keep that in mind if you're traveling with a family. This is a really unique, once-in-a-lifetime experience, and it's worth every penny. One note: you'll be sitting on the floor for around two hours, unable to move, so wear comfortable clothes and use the bathroom before you enter the stable. Older kids would probably enjoy this, but for younger kids, it might get boring and they might get impatient and antsy, so keep that in mind if you're traveling with a family. so awesome! this was an experience not to miss! it was fascinating to see the wrestlers train and to get a better understanding of their training and lifestyle. *note if you have back problems, I don't recommend this activity! you have to sit on the floor for up to 3 hours and you can't stretch your legs out in front of you, so it gets a bit uncomfortable. but otherwise, this is worth every penny! so awesome! this was an experience not to miss! it was fascinating to see the wrestlers train and to get a better understanding of their training and lifestyle. *note if you have back problems, I don't recommend this activity! you have to sit on the floor for up to 3 hours and you can't stretch your legs out in front of you, so it gets a bit uncomfortable. but otherwise, this is worth every penny! Great experience. Meeting point was directly at the stable. Free picture with sumo wrestlers at the end of training for free. Great experience. Meeting point was directly at the stable. Free picture with sumo wrestlers at the end of training for free. The guide, Kota-san was really kind as he went back for us because we arrived a little late. He was also very knowledgeable about Sumo and answered all of our questions well. The guide, Kota-san was really kind as he went back for us because we arrived a little late. He was also very knowledgeable about Sumo and answered all of our questions well.